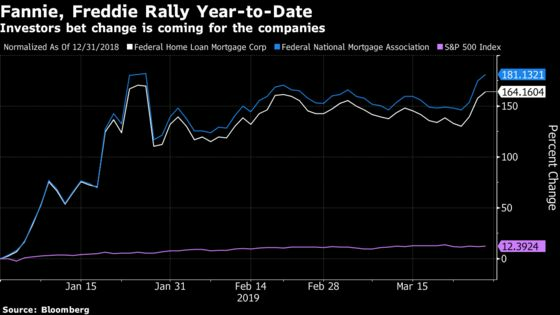 (Bloomberg) -- Analysts are calling President Trump’s outline for reforming Fannie Mae and Freddie Mac “vague,” and are cautioning that any realization of the plan-for-a-plan will take significant time to unfold. Goldman sees hesitation about disrupting mortgages and housing before the 2020 presidential election. Trump’s memorandum, released by the White House Wednesday, calls on the Treasury Department to write a proposal for ending federal conservatorship of Fannie Mae and Freddie Mac, and for increasing competition. Shares of Fannie continued to climb on Thursday, rallying as much as 6.2 percent in early trading, while Freddie rose as much as 7 percent. Both rose to the highest since late January, and both have soared so far this year amid investor optimism that administrative moves would be good for shareholders. Fannie has surged 183 percent year-to-date, and Freddie has gained 166 percent. The memo’s release, along with lawmakers’ fresh focus on the issue, show that housing finance reform has attracted “substantial” attention,” but the Trump administration will probably “proceed cautiously to avoid disrupting the mortgage and housing markets ahead of the 2020 presidential election,” Hatzius wrote in a note. “While this release confirms market expectations that the White House is going to pursue GSE reform this year, it remains unclear if it is feasible, and we remain cautious on the value of the GSE shares,” George wrote in a note. Fannie Mae and Freddie Mac’s recapitalization seems a foregone conclusion after Senate Banking Committee hearings March 26-27 failed to establish a clear legislative path forward, in our view. The Trump administration issued a note following the hearings that solidifies Fannie and Freddie’s future yet tries to build consensus for tangential legislative reform. The order, which had been expected for months, is “the start of a lengthy process,” Seiberg wrote in a note.